Würzburg is a remarkable and beautiful German city. 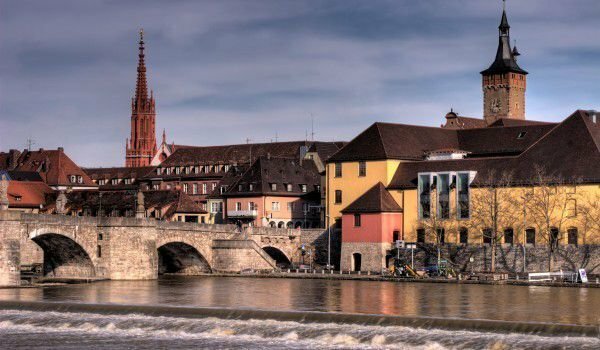 Situated in the north of the southern German province of Bavaria, Würzburg is a major center of the picturesque district of Lower Franconia. 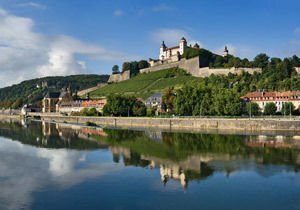 Beautifully situated along the Main River, Würzburg extends over an area of 87.63 square kilometers. The population of this interesting German city is little more than 130 000 people. It is located 115 km southeast of Frankfurt and 115 km northwest of Nuremberg. The history of Würzburg began in the early 8th century, the first historical evidence of the then village dating from 704 and 742, St. Burhard appointed the first bishop of Würzburg. The first church was built in 788, and was consecrated by King Charlemagne. Episcopal bishops gradually create a secular state, to which in the 12th century are connected large parts of Franconia. Between 1040 and 1225 was built and still exists today the Romanesque cathedral. Würzburg was captured in 1631 by Swedish King Gustav Adolf. From 1803 the town was annexed to Bavaria, and in 1805 became the capital of the Würzburg Duchy. In 1821 the bishopric was restored. On March 16, 1945, during World War II, Würzburg was almost completely destroyed by British aircraft. Over the next 20 years, many historic buildings have been restored to their original form before the war. A tour of the sights in Würzburg is quite long and definitely has a lot to see. It is better to start from the city center, where you find City Hall, the beautiful old cathedral, which impresses with its two towers, raised in the Gothic style. Next to it is located the New Cathedral, called "New Munster". Its architecture is much more lush and baroque focused. Also in the baroque style is the Episcopal Residence in Würzburg. 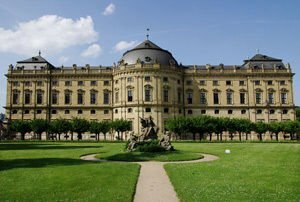 The Episcopal Residence in Würzburg is the palace of the bishops who ruled the secular episcopal state for more than 8 centuries. It was designed by leading Baroque architects - Johann Lucas von Hildebrandt and Maximilian von Welsh, Robert de Kotte and Bofrand Germain, who were known architects of the French style. But the chief architect was Balthasar Neumann, the architect of the prince bishop of Würzburg Johann Philipp Franz von Schonborn and his brother Carl Friedrich von Schonborn. Construction began in 1720 and was completed in 1744. Venetian painter Giovanni Battista Tiepolo, assisted by his son Domenico, painted the murals in the building. The most impressive elements of the interior include large pillars, chapels and the great hall. The building even has a "nickname"- "beautiful home of the parish priests in Europe", a name issued by Napoleon . The residence was heavily damaged during World War II, but is in the process of restoration that continues since 1945. Restoration has absorbed over 20 million euro. The palace belongs to the list of architectural masterpieces of the South German and European Late Baroque style and thus joins famous palaces like Vienna, Schönbrunn, Paris and Versailles. The residence is listed in the List of UNESCO World Heritage Sites in 1981. Around the residence is a wonderful park, where locals and tourists go for recreation and entertainment. Besides the two cathedrals in Wurzburg are several churches, one of which is the Marienkirche (Our Lady) Red Cathedral. The tower of the cathedral is 84 meters high. Marienberg Fortress (Festung Marienberg) is located on the west bank of the River Mein and has existed since ancient times. After the Swede Gustav Adolf conquered the region in 1631, the castle was rebuilt in baroque style. Today, it is a park and museum. As early as 704 on the hill was built the church and in the 13th century were built the first fortifications. In 1482 the castle was surrounded by a wall. Somewhere around 1600 Julius Ehter repaired the castle and turned it into a Renaissance palace. After a march of Gustav Adolf in 1631 there was another reconstruction, and a lovely garden appeared. Marienberg Fortress is the symbol of Würzburg and was the home of princes and bishops, for more than 500 years. Only after the Bishop's residence was built, the princes moved their headquarters there in 1744 on a steep hill around the castle's magnificent vineyards.